We previously reported the advanced stage of building progress, and we also talked about Indutec Solid, a company that transforms material, so now let’s talk about Butech a company belonging to the Grupo PORCELANOSA, which undertook the study and development of the structural system of the facade and provided technical support during the installation. But, most importantly, we must admire the impressive result achieved in this majestic building built in Shenzhen, China. 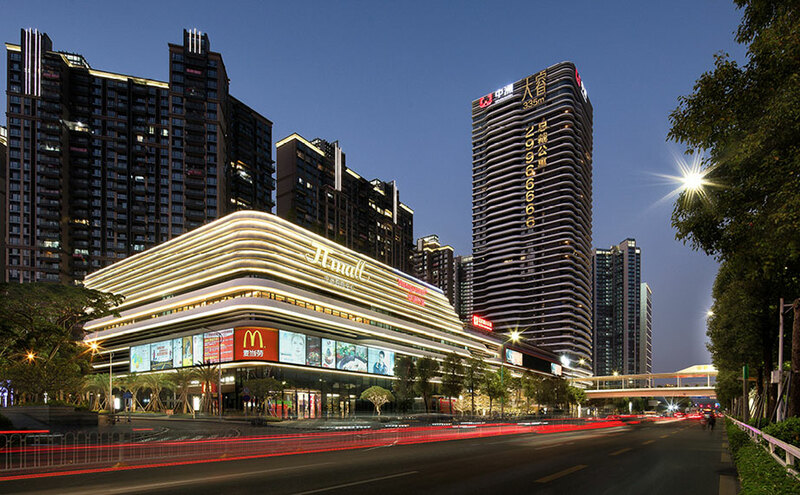 Now turning to major features of the project "The Nakasu Central Park shopping mall, carried out by Zhongzhou, has a 28,100 m2 facade made with Grupo PORCELANOSA’s mineral compact KRION®, and a height of 160.30 meters in its residential area. The complex is located next to the airport and the long distance bus terminal, an ideal place to locate this centre for fashion boutiques, jewellery, leather goods, beauty spa, food franchises, supermarkets, cinemas ... "
"Centralcon Building Shopping Mall and Residential Building"
Architect: Zhao Guo Xing - Jack "Peddle Thorp Architects"
KRION®: Transformers: Indutec Solid, S.L.